This is an excellent book with a new perspective on, and concerned with, the interpretation of Bach's Lute Works. The book is very useful and informative from both an academic and performance point of view. It contains many examples and comments and also the manuscripts of the Lute Works. It is a good source and reference point for those familiar, and not so familiar with, the transcriptions made by Jozsef Eotvos. A very useful and welcome addition for musicians and scholars to browse at their leisure! 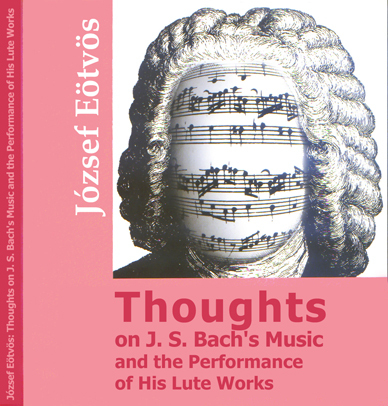 After the publication of a very successful Hungarian edition and many 'live' lectures all over the world we now look forward with your help to produce an English version of 'Thoughts on J. S. Bach's Music and the Performance of His Lute Works' by Jozsef Eotvos. Welcome to GoldbergVariations.org ! This website will feature information about this incredible masterpiece and of course also about other Bach works. The most part of of the material will be based on my contributions: unpublished articles, thoughts, reviews and more, not only in written form, but also as images, audio, and visual clips. At the same time the goldbergvariations website is open to contributions by other �Bach friends� and depends on people like you for any further material. A site dedicated to Bach's Goldberg Variations. Includes a huge listing of Goldberg Variations recordings and links to other sources of information on Bach and the Goldberg Variations. Andrea Padova first achieved critical attention when he won the "J.S.Bach" International Piano Competition in 1995 and since then has been widely considered "one of the most important contemporary interpreters of Bach on the Piano" (Mainzer Allgemeine Zeitung). What else can I say? I've been a fan of Lara ever since her Bach Works CD first came out over 10 years ago. Her versions of the 2nd Partita and the 3rd Sonata for Solo Violin remain my favorites. I always hoped that she's record the entire cycle someday and she hasn't disappointed me. I am eagerly awaiting my copy of this CD which will be released soon. Also, check out Lara's brand new web site at http://www.larastjohn.com/.
" AT LONG LAST, THE WAIT IS OVER! TWO FULL CDs WORLD PREMIER RECORDING! The Art of Fugue is the long anticipated Fourth volume in Richard Troeger's groundbreaking, world premiere series of Bach's keyboard music performed entirely on the clavichord, exclusively from the Lyrichord Early Music Series. This edition features the complete Art of Fugue, along with stunning violin transcriptions, and fantasias, including the thrilling Chromatic Fantasia and Fugue. Two full cds. The first three volumes all received rave reviews both here and abroad - The Art of Fugue is a promise fulfilled!" "Katherine Roberts Perl, of San Francisco, California, is outstanding among her generation of harpsichord performers. She is dedicated to the challenges of expressive harpsichord playing and is known for her poetic interpretations and sensitivity to acoustics. Her unique playing style has been developed over thirty years of performing on the harpsichord, beginning with her studies as a teenager in Los Angeles." "Chaconne is really two novels in one, a tale of two lives separated by centuries in time. It is a love story; Milo, the protagonist's love for life, and the music of J. S. Bach. Joseph Mastroianni’s masterpiece rings true, like one who saw it happen. Milo's experience comes alive in vibrant and earthy language and his world swirls with the sights, sounds, and tantalizing aromas of the big city. The author portrays a flesh-and-blood Bach refreshingly knocked from the quotidian academic pedestal. The counterpoint between Milo and Bach is vital, original, and satisfying. In the harmony of that counterpoint, Milo finds redemption and peace. Mastroianni has composed a beautiful and gripping novel, a spiritual work, to those who know how it should be read." "This inspirational history making debut CD of Bach's intensely complex and emotional Goldberg Variations by twelve year old piano prodigy Chloe Pang will move and enlighten you." "Chloe's performance reflects her affection and devotion to this great work...her knowledge of the style is impressive." This site is intended as a point of reference for all those who love the high musical and artistic form of the Fugue. Tononi Records is an independent Record Company which was formed in 2000. The first CD to be published is a 2CD album of J.S.Bach's Sonatas & Partias (sic, you will see why we have used Partia rather than Partita, if you visit the site) for solo violin played by Benedict Cruft. Cruft has been specialising in performing these six masterpieces as a set, over a pair of recitals since 1987 and recorded them in a six day period in the Autumn (fall) of 1998 in the glorious acoustics of the early Norman Binham Priory in Norfolk. Ashmont Music is a small independent record label and distributor specializing in viola repertoire. Here you will find information about recordings currently available from us and be able to order them. Partitas for Keyboard with Alto Saxophone! Bob Gallway - Sax, John Sankey - Keyboard MIDI accompaniment. "Telarc achieved its reputation for the exceptionally clear, natural sound of its recordings. Even before the public had heard of the digital process, they were embracing the sound of Telarc. Critics have praised it, and Telarc 's artists rely on it, knowing that Telarc's recorded sound gives them the most faithful possible representation of their artistry. " "German virtuoso Barbara Westphal's viola recording of Bach's 6 cello suites sheds new light on these great masterpieces. Westphal's viola playing features flawless intonation and gorgeous viola tone from her 1570 Da Salo instrument." Peter Watchorn has been active as a harpsichordist since 1974. ... In 1995 Peter Watchorn received a doctoral degree with his dissertation on the English Suites from Boston University. His career has taken him throughout Europe, the United States, and his native Australia. This recording is the first in a series that over the next few years will present the complete harpsichord works of J. S. Bach. Warner Classics International is part of Warner Music International, a division of the Warner Music Group. WMG has its headquarters in New York with offices in London and operates in 64 countries through a network of 47 affiliates, 22 licensees and seven associated creative labels. The Musical Offering is an independent record shop specializing in early music, choral, chamber, and keyboard music, as well as selected symphonic and operatic recordings. We intend to have the finest selection of early music on the planet. "Fourteen-year-old Johann Sebastian Bach worked late into the night. The notes in front of him sang. Little did he know that he was preparing to make history. This is the untold story of the man whom many consider the greatest composer who ever lived, the story of Bach's love for his family, his battles with fools and his passion for God. Bach's Passion transports you into the world of 18th century Europe. It places you at the scene of the creation of musical masterpieces. It inspires you with the assurance that perseverance will be rewarded "
The Harmonia Mundi Bach Edition brings together some of the world's finest Bach interpreters in some of the world's most highly acclaimed Bach recordings. For over 40 years, the music of Bach has played a pivotal role in Harmonia Mundi's catalog. From the pioneering organ recordings of Lionel Rogg to the cutting-edge scholarship of Andrew Manze, Harmonia Mundi artists have always remained at the forefront of Bach interpretation. Possibly the series' most compelling volumes are those led by conductor Philippe Herreweghe. who is widely considered to be among of the finest living interpreters of the music of J.S. Bach. The BACH.Bogen enables the string player to play on one, two, three and four strings simultaneously and to change flexibly between these combinations. Its high arch allows polyphonous playing and a lever mechanism effects the tension and release of the bow's hairs. ESS.A.Y is pleased to add a host of new releases to its catalog of treasures. Look through our web site and our catalog and let us know how you like the ESS.A.Y Recordings you listen to. Audun Kayser has made numerous recording, including Halfdan Kjerulf's complete piano music and the Goldberg Variations. His CD with the Grieg piano concerto with the Bergen Philharmonic Orchestra has got excellent reviews and is with far over 100.000 sold copies the best-selling classical record ever in Norway. "Abram Bezuijen (1966) studied organ at the Rotterdam Conservatory with Arie J. Keijzer, and piano with Frans van Hoek. In 1990 he earned the diploma for Music Pedagogy and in 1991 that for Performing Musician (organ). ... Abram Bezuijen plays concerts in Norway, the Netherlands and Germany and has made various CD and radio recordings." The complete recording of the music by Johann Sebastian Bach on 170 CDs. A rare event in the history of records and recordings: hänssler CLASSIC is proud to present the complete works of Johann Sebastian Bach which will be published on 170 CDs with recordings just by hänssler Classic. The EDITION BACHAKADEMIE is a joint venture of hänssler classic and the Internationale Bachakademie Stuttgart. The EDITION BACHAKADEMIE will be completed by the Bach year 2000. "For almost half a century Erato has been faithfully and imaginatively serving its public both with music by neglected composers and the mainstream repertory. When the Company was founded in 1953 there was very little Renaissance and Baroque music to be found in the catalogues of the recently developed long-playing record. This was to be the area in which Erato was first to make its mark and which subsequently established its fine and enduring reputation. Nowadays, when music from so many centuries and different countries is accessible through the medium of the compact disc, it is easy to forget how different the situation was in those far-off days. One of the chief aims of the Erato pioneers founder Philippe Loury and A&R director Michel Garcin was to bring to life once more the early and Baroque music of their native France and to make it available to as wide an audience as possible." We've long known that music has some deeply moving properties. We are just beginning to learn how deeply moving music really is. We are beginning to learn that in the very young, music can reach into the web of thought itself and enhance higher brain function. arrangement we believe are obvious. "Site supports Paul's CD 'ESSAYS'. Samples of pieces, including Cello Suite #1, Anna Magdelana manuscript, ethnomusicological point of view. Other pieces deconstruct the Suite, and are improvisations based on interacting world high art traditions. Notes on the pieces purchase info and short Bio included." "Founded in 1991, our original goal: to issue wonderful music in the following categories: Classical, Jazz, Children's, Oldies, and World Music. In 1993 we initiated our From the Vault series of great re-issues. Our goals for this series are twofold: first, to make available fine albums of the 1950s, '60s and '70s that were both genuinely beloved and acclaimed as milestones. Second, to demonstrate the extraordinary sound quality captured on the best Masters of the period, quality which even the finest pressings could only partially convey." 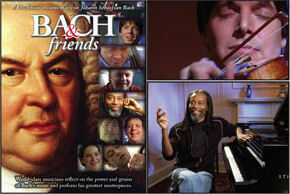 - Check out their re-releases of classic Bach recordings! "... here is a recorded series that will present all the major keyboard works of J.S. Bach in virtuosic performances on the clavichord, using superb reproductions by Ronald Haas of period instruments. The player is Richard Troeger, noted clavichordist, harpsichordist, and fortepianist. Vol. 1 of the series, just released, is a 2-CD set ( priced as a single CD! ) presenting the 6 Partitas in their clavichord debut, revealing new clarity, brilliance, nuances, and colors. Richard Troeger is a keyboard master whose Bach interpretations are among the finest ever recorded." - Ordering information is available at the Lyrichord web site. A label that specializes in Classical recordings by such notable Bach performers as Anner Bylsma, Andrew Manze, Peter Wispelwey, and others. Many sound samples available online! TELDEC will be the first record company to release the complete works of Johann Sebastian Bach in a uniformly packaged edition of roughly 150 CDs. BACH 2000 will be launched worldwide on 28 July 1999 and be available from the very beginning of celebrations to mark the 250th anniversary of the composer's death in 1750. Tjako van Schie is a talented pianist from the Netherlands. He has recorded a well-played and tastefully interpreted CD of the Goldberg Variations on the Piano which is currently available at http://www.cddiscovery.com. 'The Stewart Society for the Recorded Sound is pleased to announce the release of J. S. Bach's Sonatas and Partitas for Violin (BWV 1001-1006) and the Unaccompanied Partita for Flute (BWV 1013) performed on the viola by Scott Slapin. "I have also made every effort to maintain the integrity of the Bach Cello Suites when I recorded them on the trumpet. I have pursued a warmer, 'woodier' tone by recording fairly close-miked and with a softer, more relaxed volume. I also tried to model the trumpet sound after the cello with regard to articulation, phrasing, vibrato and ornamentation. " Also check out http://www.execpc.com/~bluemoun/jsbach.html at Blue Mounds Productions. The famous Dutch cellist Anner Bylsma has written the long expected book about the Bach Cello Suites. Now, it is published. Its title is "Bach, The Fencing Master or reading aloud from the first three cello suites". The books brings new life into the discussion about how to perform these suites. Whoever reads it gets really enthusiastic about it. Mr. Bylsma's knowledge, sense of humor and entirely new view on the suites are compelling. A talented young Violist whose playing is as beautiful as she is. :-) Check out her CD of Bach's 2nd Suite for Solo Cello played on the Viola! It also includes the Arpeggione Sonata by Franz Schubert and the Cadenza for Solo Viola by Krzystof Penderecki. 'Baroque Masters' - description of the CD recorded by Rafal Nowak - including mostly J.S.Bach and also N. Bruhns. 'Classical Music Online is the premiere online resource dedicated exclusively to classical music.' Also the home of Club Lara! This site features a wealth of information and resources related to Bach including a comprehensive Bach Bibliography, Source Studies of the Well-Tempered Clavier Book II and high quality MIDI files. This site also features the 'Bach' Musicological Font, a high quality font face with additional music symbols that blend seamlessly with the text. There is also information about Yo's publications including J. S. Bach's `Das Wohltemperierte Clavier II': A Critical Commentary, 3 vols. and many online essays. Note: The original jsbachexperience.com site no longer exists. The web site is now one of the many sites owned by unscrupulous companies who fill them with pop-up ads and attempt to make it impossible for you to leave. Please do not visit this site. Probably the largest collection of Bach MIDI files on the web, this site is organized using the Bach BWV catalog. Canons & Fugues contains a theory of canonic and fugal processes linked to examples of analyzed canons and fugues by J. S. Bach. Canons include those of the Goldberg Variations and Addendum, Musical Offering, Art of Fugue, Orgelbüchlein, Vom Himmel hoch, Clavier-Übung III, Honorific works and concludes with an essay "Why Did Bach Write Canons?" Fugues include the Art of Fugue, portions of the Well Tempered Clavier, and conclude with directions on how to Analyze a Fugue. The site also contains extensive biography and history including Bach's Education & Career, the Bach Family, the Baroque Ideal, Bach's Contemporaries, and an essay on the importance of Bach's work in contemporary art and criticism "Not Bach, but Meer." A newsgroup dedicated to the discussion of J.S. Bach and his music. Note: you must have Newsgroup software properly configured and your ISP must carry alt.music.j-s-bach. If you cannot access alt.music.j-s-bach through these means, you can access it via DejaNews at http://www.dejanews.com. 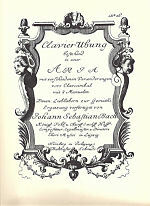 The Bach section of the most extensive collection of classical MIDI files ( over 700 Bach files! ). This is Simon Crouch's home page, mostly devoted to J. S. Bach. Links from here to my cantata pages and to my Bach Books page. First-rate MIDI sequences of works by Bach, Domenico Scarlatti, and William Byrd. 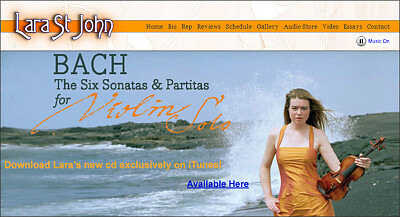 Home page of the lovely Lara St. John who recorded a remarkable CD of the 2nd Partita and 3rd Sonata for Solo Violin. A great site with audio clips. An excellent Gould site maintained by Sony. Has a discography, audio files, links, and more. On this web-site, some less known illustrations of stations in the life and work of Sebastian Bach are provided. Catalogue (in French) of all vocal and instrumental works by J.S. Bach with alphabetical indexes.